Apparently plucked from obscurity Jodi Scurfield has become a director with a Hollywood star as lead. Speed Kills is presented like a biography and seems to be a semi-biographical film about Don Aronow. With speed, drugs, a King (Prashant Shah, A Gentleman) and a Vice-President (Matthew Modine, The Dark Knight Rises, Backtrace) there is plenty to see. 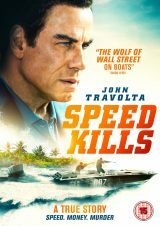 1987 and a man walks into a speedboat showroom and demands to see the owner Ben Aronoff (John Travolta, Pulp Fiction, I am Wrath, Criminal Activities, The Forger) who has been avoiding him for weeks. But he comes out of his office and tells the man that he has paid all his debts and more, so go tell his boss that. A little later Ben jumps in his car and notices that the man is still watching his business, he pays it no mind and goes to drive off when a car flags him down and when he pulls up a guy pulls out a gun and fires. We flash back twenty five years to 1962 and Ben is in New Jersey and he is a successful contractor, husband, father and entrepreneur but it is time to get out of Dodge and start a new life as his connections with the Mob are a bit strained. So he takes his money and family to Miami for a new start. Once settled in Ben doesn’t know what to do with his life, but he cannot leave his past behind and he is found by Jules Bergman (Jordi Mollà, Riddick, Bad Boys II) who takes him to Mob boss Meyer Lansky (James Remar, What Lies Beneath, 2 Fast 2 Furious) who reminds him about his duty to the family, but Ben just wants to do his own thing. But what to do? In the meantime he meets lawyer Shelly Katz (Michael Weston, State of Play) who he hires for projects unknown but he will get 3% of whatever it is. But whilst on the beach he spots somebody challenging another boat to a race and that is the moment Ben knows what he wanted to do and when he meets boat builder Knocky House (Mike Massa, Iron Man 3) and gets to race he is completely sold. He buys a speedboat yard and set up Formula Marine Speedboats. Soon they are racing and with Ben’s maverick approach they are soon winning trophies and selling their speedboats and starting to make a fortune, but it is a double edged sword travelling the world and racing boats and soon Ben needs to earn extra money and that is where Mr Lansky comes back into Ben’s life and his family from his. Speed Kills is a decent movie especially from a complete novice.